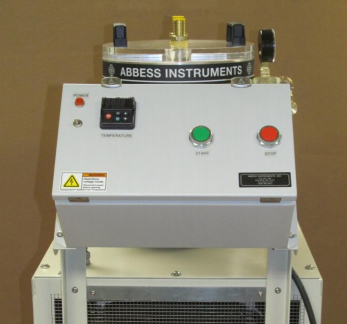 The Abbess Instruments Vacuum Cold Trap is designed to precipitate vapors like water and other perceptible materials from gas streams developed in a vacuum processing or drying operation. Products or articles under vacuum may evolve vapors that can compromise the product or vacuum system components. The Cold Trap is used to filter the exiting gases of water, alcohol or other perceptible materials, in order to ensure that they do not damage or contaminate pumps or other items. The process gas is delivered to the Cold Trap chamber and exposed to -80°C temperature and trapped by freezing or cryo-plating the material on baffle plates in the trap. This trapped or frozen material is removed and disposed of by removing and cleaning the baffle plates in the trap. If ultra-low (-86C) temperatures are not needed, Abbess offers a more economical single stage refrigeration system which controls temperatures down to -40 degrees Celsius(-40F). These systems can be configured as standalone condensing units, liquid chillers or as part of a thermal plate control system within one of our vacuum environments. These systems can be custom sized to fit your cooling needs.